Well, it's not a secret that I am an admirer of Ken Yeang, and his unique brand of Bioclimatic Architecture - mostly because of its reliance on multiple tenets of the Veg.itecture concept: 1) use of vegetation for environmental systems; 2) use of vertical and horizontal surfaces; and the mixing of these concepts for aesthetic means. Inhabitat recently featured an amazing version of this, Fusionopolis (along with a link to a much more extensive article in the Telegraph), slated for downtown Singapore is a "... research and development complex, this structure will adorn Singapore as the island nation’s most eco-friendly skyscraper." 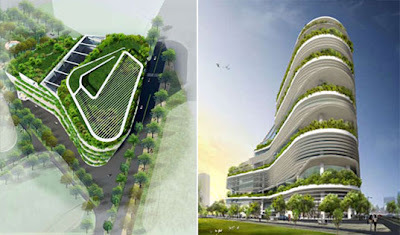 As usual, not just eye candy, but some serious green architecture in a literal and figurative sense. Via Inhabitat: "The 15-story building will be 1.4 Km high, and boast of a ‘green infrastructure.’ The building will be home to the longest continuous vertical stretch of vegetation of any building in the world. A vertical spine of planting will rise up through the building, and landscaped garden terraces will be located on each floor of the building. The vegetation will help in passive cooling and insulation. 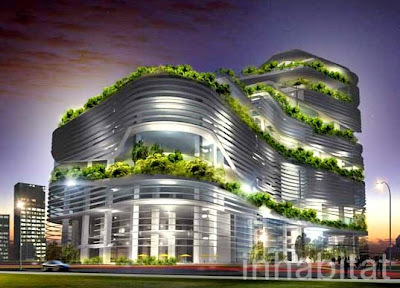 The vegetation will also improve the sense of well being of the residents." Continuing: "Natural daylight will be directed into the building interior by prisms which deflect the sunlight as it hits them. The drainage and irrigation system will also integrated green features. The whole building will function as an ecosystem, and strive to strike a balance between the organic and inorganic elements so as to make the building work like a living system." 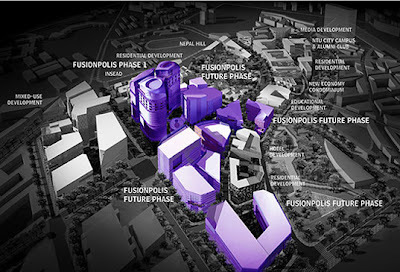 These images are part of a larger master plan by Zaha Hadid, making Fusionopolis a potential regenerative community with a mix of buildings and uses. This building up is sometimes percieved as resource-intensive, but Yeang definitely believes density is the way to protect valuable land surrounding cities. Via the Telegraph: "Some may question whether a real environmentalist should ever build a skyscraper, but he's unrepentant about this. He very much supports the case for skyscrapers, arguing that these are better than the alternative, namely cities – in countries such as China and Singapore – that expand by growing ever outwards. Their urban sprawl, he says, gobbles up valuable land better served for food production." 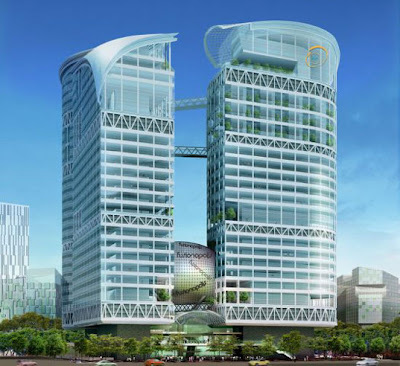 The cutting edge design of Yeang is world-renowned, and really deserves some implementation on a larger scale, both to test out the viability and provide some compelling examples of Bioclimatic Architecture on a large scale. This project boasts, via the Telegraph: "...the longest continuous vertical stretch of vegetation in any building anywhere in the world."